Australian maritime workers are frequently being exposed to potentially fatal asbestos fibres aboard foreign registered ships that have been discovered with fake papers citing that they are asbestos free. The Australian Institute of Marine and Power Engineers have expressed concerns that vessels or tug boats being brought into the country, continue to endanger the safety and lives of seafarers. The union’s concerns were included in a public submission to the federal government investigation into asbestos management. The submission states that the International Maritime Organisation has distributed warnings that asbestos has been uncovered in ship fire blankets, wall and ceiling coverings, and other parts of the ship. Federal Laws dating back to 2005, have prohibited the entry of vessels containing asbestos, however ships continue to arrive in Australia with asbestos ridden materials. The ship carry “asbestos free” certificates but they have often been proven false by respectable Australian authorities. 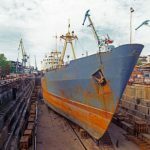 The submission also cited a difficulty in enforcing Australia’s health and safety laws on internationally- registered ship, which have proven an obstacle in the process of achieving asbestos-free workplaces. According to the submission, eight tug boats brought in from abroad, were discovered to have a serious amount of asbestos on their vessel despite being in possession of “asbestos –free” certificates. The federal inquiry on asbestos management will be finalized in June.